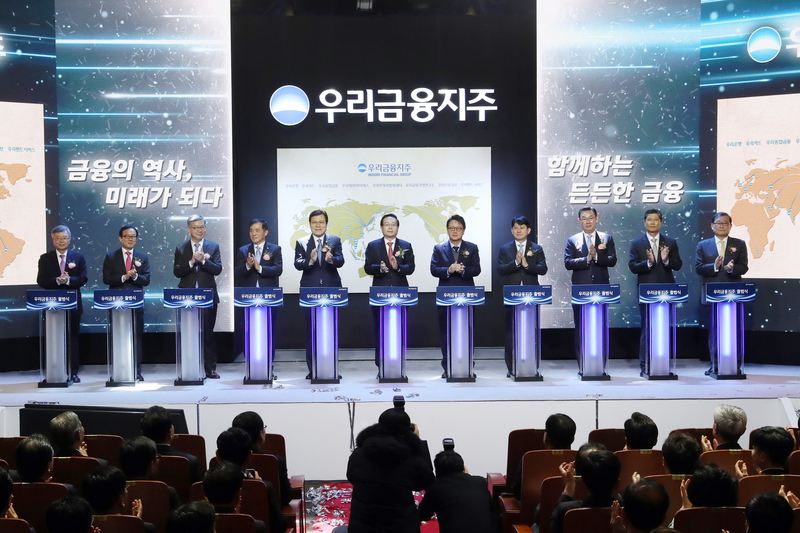 Woori Financial Group held its official launch ceremony on Jan. 14, joining four other financial groups in the country, with KB Financial Group in the lead for now. Chairman Sohn Tae-seung said the group will emerge as the top financial group in the country after consolidating its operational structure and taking over a number of non-banking financial firms in such key areas as securities, credit card and insurance, among others, to boost its competitive power as an integrated financial group. The group now has to augment its weak areas as it joins the four financial groups, which have been in business for a long time. The chairman said as he was named to keep his job as the CEO of Woori Bank until March next year. He said the group has been looking at a small asset management firm, real estate trust firm and a savings bank among takeover targets, fearing its relatively small pool of capital might cause conflicts in its M&A moves. “This year will be year for our financial group to widen its base to emerge as the top financial group in the country in no time,” said the chairman. Recalling that Woori Financial Holdings was the first financial holding company in Korea before its dissolution and Woori has experience in running a financial group now that we are back, Sohn said, adding that it will catch up with its rivals in two to three years. He said Woori Bank is strong in a number of its operational areas, including corporate banking, global banking and digital finance to name just a few. The bank has been strong in traditional areas and will strengthen corporate investment banking (CIB) in cooperation with affiliates by taking advantage of its professional workforce and capacity, he said. Woori Bank in particular, has been strong in its global operation having 430 networks the largest among the Korean banks with overseas operations, he said. The chairman said the bank will cooperate with the non-banking affiliates overseas to boost their operations by seeking out new growth businesses and help them grow. But this year, the group would have to go all out to balance growth and health as uncertainty looms large for the global financial operation. The shareholders and board of directors have decided to let Chairman Sohn lead the group and the bank for the time being, as they thought a strong leadership would be needed for the new financial group for the time being. Woori Bank, unlike other banks, has a deputy president in overall charge of key sectors, including marketing and the individual group in Sectoral Vice President Chung Chae-bong, a former Hanil Bank official. He is regarded as an expert in the banking operation area. Other key affiliate CEOs include President Chung Won-jae of Woori Card, President Cho Woon-haeng of Woori Integraded Finance and Vice President Choi Dong-soo of Woori Financial Holdings, among others. Chairman Choi Jong-gu of Financial Services Commission (FSC) said the remaining government stakes in Woori Bank will be taken care of as soon as possible. In his congratulatory speech at a ceremony for launching Woori Financial Group held on Jan. 14, he said the remaining government stakes, around 18.4 percent, will be taken care of as soon as possible. He said the government will not exercise its stakeholder rights in the management of the financial group to ensure the independence of the financial group in management. What the FSC chairman said meant that the government shares will be sold whenever a buyer comes forward with right prices to pay for the stakes.